Fountaingate Gardens is closer to welcoming you home! We’re getting closer to welcoming you home to Fountaingate Gardens! Maps and Engineering Plans Are Under Final Review! We’ve received several key approvals from the Town of Huntington, and we are getting closer and closer to construction. 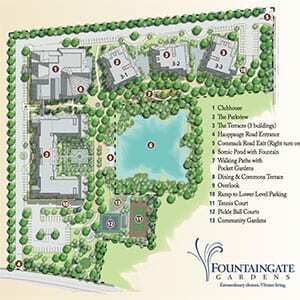 That means that Fountaingate Gardens, the contemporary Life Plan Community* backed by Gurwin, is even closer to reality. With zoning, engineering and map plans receiving approvals from the Town of Huntington Planning Board and the Suffolk County Sewer Agency, the 10-acre campus of Fountaingate Gardens will now really begin to take shape. Construction is planned to begin later this year, and you can hear from depositors about what’s making them so excited about Fountaingate Gardens’ opening. With all this headway being made on the project, floor plans at Fountaingate Gardens are selling out rapidly! For example, the Willow floor plan residences are sold out, and only one more Laurel floor plan residence remains available. In addition, many of the 16 floor plans offered are already more than 50 percent reserved. With these new building approvals, more future resident deposits, and the backing of the Gurwin Family of Healthcare Services, Fountaingate Gardens’ future for active retirement on Long Island is looking more intriguing by the day! For more information about the extraordinary choices and vibrant living at Fountaingate Gardens, click here to receive a free info kit or simply call 631-715-2693! Updated with Virtual Tour! Is the Holly Your Perfect Home?